In a saucepan, bring 2 inches of water to a boil. Add beans, peas, squash, zucchini and onion. 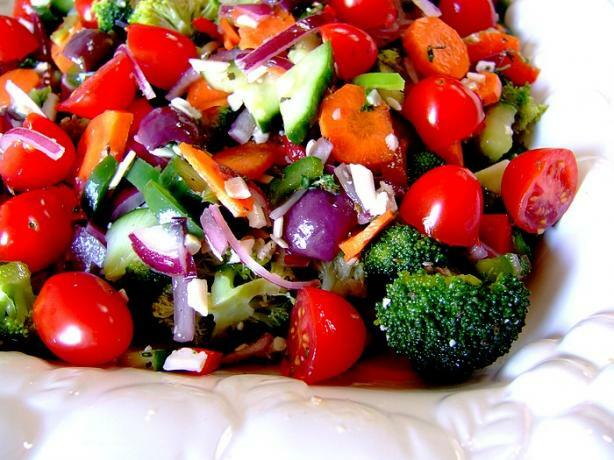 Reduce heat, cover and simmer for 2-3 minutes or until vegetables are crisp-tender. Drain, rinse with cold water and dry. 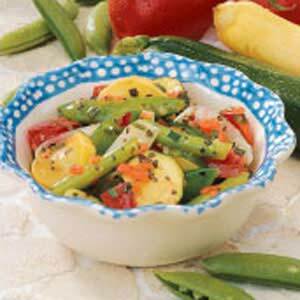 Place vegetables in a bowl, add the remaining ingredients. Stir gently to coat. Refrigerate until serving. Yield: 12 servings. One serving (1/2 cup) equals 47 calories, 2 g fat (trace saturated fat), 0 cholesterol, 132 mg sodium, 6 g carbohydrate, 2 g fiber, 1 g protein. Diabetic Exchanges: 2 vegetable.